By LUDWIG VON KOOPA - Old information with new names gets a new press release. Plus, exposing FAKE NEWS about licensed products. About four and a half months ago before Nintendo launched the Nintendo Switch, I published a very detailed analysis article on the then-announced online features that Nintendo will be offering as a subscription service for the Nintendo Switch. I was pretty critical of it. Also: Instead of launching in late 2017, the subscription will begin sometime in 2018. Online services will be free until then. Let's talk about the two updated features and anything else new. First up, instead of “Exclusive Deals” there are now “Nintendo eShop deals”. It turns out that these are exactly the same as before but with a different name, and these already exist anyway through My Nintendo. This is just emphasising that the rewards will be of a digital nature, in case you thought you could print out coupons to GameStop or something. Yes, what better way to show off added online multiplayer than to show two games that look like they're single-player? HOWEVER, it no longer states that these classic titles, which for now are only NES games (and may be SNES or... other consoles in the future), will be FREE. They might be. ...They might not be. We don't know. What happens to them if your subscription expires? The actual subscription terms for the Nintendo Switch Online service are not available yet, which is annoying for this article because that's where all of the details are instead of these non-descriptive headlines. The original issue people had with the Monthly Game Download is that you'd get this added-functionality classic NES game for a month, and then you'd have to pay up to keep it. It's possible here that they just skip the one-month trial and make you buy it if you want it. ...Which... you probably don't. The Nintendo Entertainment System wasn't exactly known for its multiplayer excellence, besides one-player-at-a-time gameplay and Donkey Kong Jr. Math. In related news, you can have access to the dedicated Nintendo Switch online lobby and voice chat app as a “free, limited version” this summer 2017. The “free” is notable, since this is during the time period where the Nintendo Switch Online service won't exist (not until 2018). I don't think you'll need to pay for the service AND the app, and I believe it to be likely that your subscription will give you a code to be able to access the full app when it's available. Pro-tip: Just because it's really slick, cool-looking, and Japanese, doesn't make it an official Nintendo-made product. Again, being licensed doesn't mean your products are now Nintendo's. It means that you pay Nintendo and they give you an Official Nintendo Licensed Product seal so they don't sue you. Left: A Mad Catz manual for a Wii U/3DS product. Right: A HORI manual for a Nintendo Switch product. The point? The third-party manufacturers are licensed by Nintendo, but it's the third-party manufacturers’ products, not Nintendo's. In reality, the reason the Nintendo Switch doesn't have voice chat is to protect players from creepy people, whether they be the perverts that got Swapnote shut down, screaming children, or the CIA or NSA listening in on you. 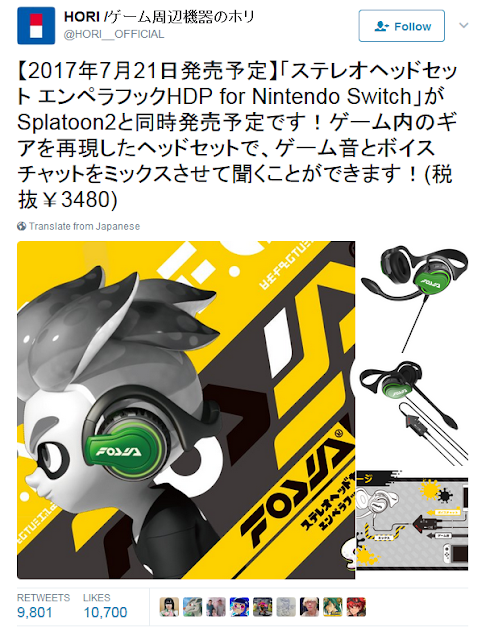 If you want to get around this protection while having voice chat and in-game audio in the same headphones, then I really don't see the issue with having three wires (one from your smartphone with the voice chat, one from your Nintendo Switch with the in-game audio, and one from your headphones so you can actually hear it) go into a central squid-shaped device. You can have everything be wireless and surround sound, if you're really terrified of hooking things up. As for the pricing? I think it's lower pricing than what most people expected. If you only want to play online occasionally, you can drop in that $4 for one month and then maybe try to get as many eShop deals and classic games as you can. (Try around your birthday for the deals.) To all the people saying that Nintendo needs to charge for quality servers, how do you square that with Nintendo charging substantially less than their competition? Does it mean that Nintendo is much more efficient? Is the subscription cost a loss leader (charging below cost)? ...Or does it mean that Nintendo's servers aren't going to be quality? I don't know the answers, but I guess one question I have to people who have played any Nintendo Switch games online: Is it a better or similar experience to the free online service on the Wii U? ...And will it be improved or simply maintained when Nintendo gets the subscription money flowing in? Ludwig doesn't want to call TechnoBuffalo fake news, since he likes buffalo. Still, he has no choice. If Ludwig ever gets a Nintendo Switch (and he wants one, of course! ), he plans to subscribe to the service, but he doesn't know how useful it will be overall without a smartphone by his side. He still doesn't own a smartphone. He has no plans to buy third-party accessories. A year later, they once again renamed Classic Game Selection to just be about the NES. You can save a lot of money on online membership if you're part of a family... or claim to be. Nintendo Switch Online has released, and Nintendo won't actually improve the online or have servers. The subscription costs are pretty dang cheap, actually. I mean, I pay more than that for my Netflix. I pay more than that to subscribe to my favorite Let's Player on Twitch! "If you only want to play online occasionally, you can drop in that $4 for one month and then maybe try to get as many eShop deals and classic games as you can." That would pretty much be my approach, lol. I dunno, sounds like you're a sucker to that Let's Player. I have a few more than that. Breath of the Wild, Color Splash, and I'm sure I'll even play Star Fox Zero again eventually, even if it's for all of 2 hours before I touch it again months later. And before you judge me, look up NintendoCapriSun on Youtube and TRY to tell me you don't want to give that guy a big 'ol hug. The reason I brought up Smash is specifically because it's online, while the three games you brought up are... not online.